Steam-bending wood is a very simple operation that you will need to learn to apply chines, transom bows, forward bottom planks, covering boards, and topsides planks where extreme bends occur. Once a piece of wood is steam-bent into shape, it will not fight to spring free of its fasteners and will be far less likely to cup or crack in the future. To begin with, there is nothing magic or necessary with steam. Steam does not add moisture to the wood; in fact, it dries it out. Many commercial kiln operations us steam heat to remove moisture from wood in the kiln-drying process. All steam does is use molecular water to transfer heat. The same effects can be achieved by boiling the lumber or placing it in a very large oven. 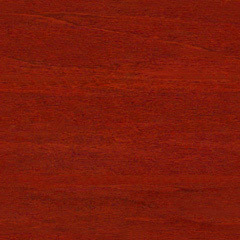 The moisture in the wood simply acts as a conductor for the heat. In kiln-dried wood, however, 6 to 10 percent MC acts more like insulation than like a conductor. Air-dried wood of about 20 percent MC is preferred. The cell walls contain nearly moisture saturation levels, aiding the heat transfer and plasticizing, yet not enough moisture to host rot spore. 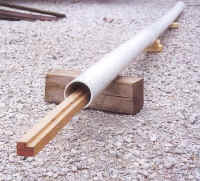 The fiber saturation point at which the cell walls are still saturated with moisture and transmit the heat easily to the interior of the piece of wood, is approximately 25 percent MC. Whatever lumber I attempt to bend, I soak it at least a day before heating. This soaks the entire surface, which aids greatly in transferring heat to the interior of the piece. I have no trouble bending kiln-dried 1/2-inch mahogany plank stock this way. 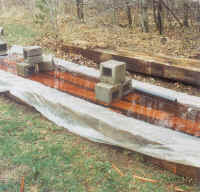 Soaking the wood, even for a short time, will cause it to expand somewhat, so let it dry for at least one week for every day of soaking before trimming it to fit. When enough heat is applied, the cell walls plasticize and can be compressed into smaller cells, as long as the original free water is gone. To a lesser extent, the lignin also plasticizes and allows the cells to slide alongside each other, as this compression occurs. Almost all cell deformation in bending occurs on the inboard, concave surface of the piece being bent. When hot enough, these cells can compress in length some 20 percent without cell wall fracture. When clamped in place and left to cool, the compressed cell walls solidify and hold their new dimension. The measured length of the plank on this inboard, concave surface will be less than it was before bending, due to the deformation (compression) of the cells. Very little (about two percent) cell deformation occurs on the outboard, or convex, surface of the wood. Apparently, these cells do not like to stretch as easily as they compress. The measured length of the plank on this outboard, convex surface will be nearly the same as it was originally. If the bent piece of wood is left clamped in place long enough to cool off, the cellulose and lignin re-solidify. The plank will now hold that shape, minus some initial "spring back" because one side of the piece is now shorter than the other. I have seen some restorers attempt to steam bend 1/2-inch, kiln-dried mahogany plank stock with a wet towel and household laundry iron held to the exterior surface of the plank. This method could not possibly effect the interior and inboard surface of the plank, where cell compression needs to occur. You have to apply enough heat for a long enough time to raise the temperature of the entire board, all the way through, to as close to 212 degrees as possible. In order to do this, you must be able to maintain 212 degrees in your steam box. Use a meat thermometer stuck through a hole in the top of the steam box farthest from steam entry. You may have to wrap insulation around your box or tube to accomplish this. The traditional rule of thumb has been one hour of steaming for every inch of lumber thickness. This must be tempered somewhat by how many pieces of lumber you put in an how efficient the steamer and box is. If you are heating a bunch of frames at one time, add a few test pieces and check them until they are wobbly and somewhat rubbery. What you expect to take an hour could very well require two.